A recently released poll from Public Policy Polls (link) shows overwhelming support for Sunday liquor sales from registered voters in Minnesota. The growing popularity of Sunday liquor sales proves what we have been saying all summer long as people sign the petition to repeal the ban. With so much backing from people across Minnesota, there will be even more pressure on politicians next year at the Minnesota Capitol to finally pass legislation to lift the outdated ban on Sunday liquor sales. In April, both the Minnesota House and Senate failed to pass a bill that would have given liquor stores the option to remaining open on Sundays. Although both bills were rejected, a law was passed to allow craft breweries to sell beer growlers on Sundays. Latest polls show there was a 7% increase in overall support from a similar poll conducted in 2014. Republican opinions on the issue of Sunday liquor sales jumped from 52% in 2014 to 60% in 2015. Minnesotans that identify as Democrats also increased their support for a repeal of the outdated blue law. 69% percent of Minnesota Democrats say they support repealing the prohibition on Sunday off-sale liquor commerce. The largest increase in support for Sunday sales came from Independent voters in Minnesota. 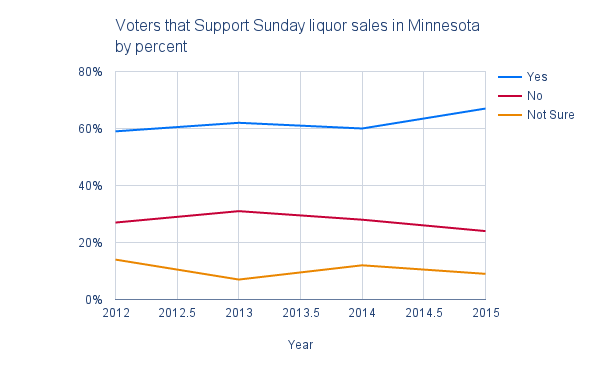 71% of Independent voters support Sunday liquor sales in Minnesota. This is a large jump from 58% the previous year. Overall, Minnesotans increased their support to modernize the blue law by 7%, bringing support to over 67%. Sunday growler sales from qualifying breweries have been legalized in many cities across the Minnesota, the sky didn’t fall. Over 7,000 Minnesotans have signed the petition at SundaySalesMN.org, and Minnesotans from every single legislative district have signed the petition to repeal the anti-consumer prohibition on Sunday liquor sales in Minnesota. Support for repealing the ban on Sunday liquor sales should only continue to grow.